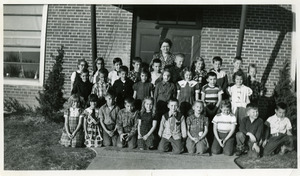 Front row left to right: Thelma Burkett, [unknown], [unknown], Dougie Streed, Karen Putnam, [unknown], Ruth Horrell, Linda Bryant, John Drew, Dale Sheahan. Middle row: Johnny Cochran, Robbie Gibbs, Robbie Bonfiglio, Vicki Lawrence, Sally Francis, Linda Yoder, Glen Davis, Paulette Carpenter. Back row: Judy Morano, Lynn Wells, Bill Morrison, Frankie Beers, Larry Seaton, Arnold Samuels, Pamela Devins, Jackie Gough, Harold Brooks, Tommy Cannon. Teacher: Mrs. Mary Dunn. 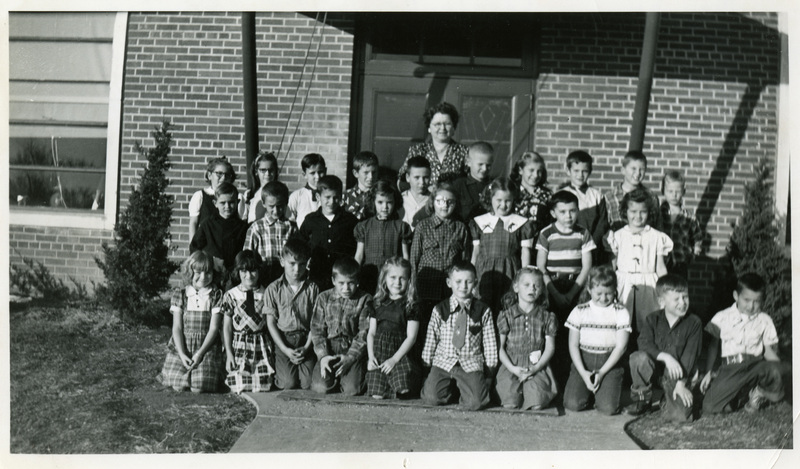 “Coralville School Second Graders, May 1954,” Iowa City Public Library, accessed April 19, 2019, http://history.icpl.org/items/show/1905.